THE most peculiar thing about US President Donald Trump’s decision to extend his country’s illegal economic sanctions on Zimbabwe last week was his failure to read trending global political and economic winds. Harare has been on a positive trajectory following the coming in of the new dispensation in November 2017. After years of isolation, the country has been gradually integrating into the league of nations with the world opening up to Zimbabwe. This is what the US failed to read when it could not shift from that unusual and unsurprising position. Traditionally, the US takes longer than expected when it comes to reversing its policies. However, the decision to impose sanctions on Zimbabwe by the US was informed by a bilateral dispute between Harare and London. This is why the extension of the illegal economic sanctions against Zimbabwe last week was in fact a continuation of so familiar a tale, a familiar song replete with the fury that Zimbabwe invoked from Uncle Sam for the revolutionary Land Reform and Resettlement Programme in 2000. But unlike in the past, where the sanctions used to scare Zimbabweans, it is a different ballgame altogether for Harare this time around. The US sanctions are confronting a Zimbabwe that has been buoyed by seismic changes in the ruling guard and an economy that is ably supported by sound and solid policies whose results have been visible in the short period that the new dispensation has been in existence. Equally compelling is the fact that Zimbabwe is drawing lessons from other countries like Russia, Iran, Cuba, North Korea and Burma, to mention a few. These have been placed under sanctions by the US but have successfully managed to run strong economies. During his address to the Chiefs Council in Gweru on January 13 2018, President Emmerson Mnangagwa said the time had come for Zimbabwe to beat the sanctions. Said President Mnangagwa: “Takaita masanctions edu aitidzorera shure, asi ikozvino hatichafaniri kuramba tichichema namasanctions. The country faces the important task of reviving an almost moribund economy and the only way out of this situation is coming together and pursuing own programmes without paying attention to the US’ never ending antics. Uncle Sam has put himself in an untenable situation. The US has been angry since 2000 over the land issue while we have continued to hold on to our land and herein lies the conundrum that will haunt that self-proclaimed superpower for many years to come. What we have, they do not and can never have. What they desire, for the most, is firmly in our hands. The sanctions will, in the coming future, galvanise Harare to take stern action when it comes to utilising its resources. Let us first hear what triggered Uncle Sam’s extension of the sanctions last week. “On Wednesday, August 8 2018, the President signed into law: S 2779, the ‘Zimbabwe Democracy and Economic Recovery Amendment Act of 2018,’ which amends the Zimbabwe Democracy and Economic Recovery Act of 2001,” a statement from the White House read. ZDERA (S. 494) is an Act that was passed by the US Congress on December 21 2001 when it imposed economic sanctions on Zimbabwe ‘to provide for a transition to democracy and to promote economic recovery’. And the US, which has not made its resentment of the ruling ZANU PF a secret, pointedly took aim at Zimbabwe’s recently held elections which they claimed were heavily skewed against the opposition. There was serious expectation from the US for the July 30 2018 elections results to go in favour of the MDC Alliance. Indeed, there has yet to be a shift from the December 21 2001 US Congress position, especially when it comes to the land issue in Zimbabwe. And Section 5 of ZDERA lays bare why Zimbabwe should be feeling aggrieved. It demands a return to the land reform formulae proposed by Western donors that included the US itself. In simple terms, the US and the West are actually saying any land ownership patterns post-1998 are unacceptable to them and unless revoked, warrant the continued stay of sanctions. This is why actions by the Americans in the aftermath of the imposition of the sanctions are important to keep in mind. In November 2012, Zimbabwe lost over US$30 million that was in transit after the country had sold its diamonds at an auction. This was after the US’ Office of Foreign Asset Control (OFAC) seized the money. And there is comfort in the misery that the US is seeking to put this country into. This time there will be no more tears over the latest move by the US. Instead there will be the coming together of Zimbabweans to conquer these sanctions. One fundamental aspect that seems to be lost on Uncle Sam is that countries can survive without undue influence from the US. Zimbabwe has received much goodwill from the globe since events of November 2017. Every progressive nation is opening its doors to us as we move to revive this economy from its current state. This therefore means that we can continue with the current re-engagement efforts — minus of course the US. Our strength lies in our strategic location and the resources that we have at our disposal. These are what the world is clamouring for and only those who respect our sovereignty and territorial integrity must be allowed to come in — but only as equal partners. President Mnangagwa must be unequivocal on this one; those who are opposed to us must never be allowed to be near our land and resources. Already we enjoy support and good relations with countries from Southern African Development Community (SADC), the Africa Union (AU), China, Russia, Belarus, Spain and Brazil. Britain, a global powerhouse, is slowly opening up to Zimbabwe with the European Union (AU) also showing signs they could work with Harare. The re-engagement path Zimbabwe has taken will also begin to bear fruit with many investors lining up to do business in the country. If there is one story that has redefined us as a people, it is the success of the Land Reform and Resettlement Programme. Under difficult circumstances and operating in a harsh economic environment, Zimbabweans have defied the odds. Zimbabwe is currently revelling in the record-breaking tobacco season set by former white commercial farmers. A record 238 million kg have been put on the market by Zimbabwe and indications are that the country will surpass that target again this forthcoming season. Maize production has increased and the nation is moving towards becoming food-secure, thanks to hugely successful Command Agriculture Programme. The cotton industry is on the rebound, so is every sector in agriculture. Increased Government support means, in the shortest possible period, we will be having enough raw materials to feed the manufacturing sector. There has been unprecedented growth in this sector, mainly due to increased production and the combined efforts of President Mnangagwa and Minister of Mines and Mining Development Winston Chitando. As at the end of July this year, the country had hauled 21 tonnes of gold, in the process breaking the record set in 2009. Of the 21 tonnes, 13,5 tonnes were produced by artisanal miners, with the remainder coming from commercial ventures. There has been significant appetite by investors in the gold sector and more production is expected as the year draws to a close. Several other minerals that have caught the attention of investors include platinum, coal, diamonds and chrome. The Sunday Mail this week reported that Zimbabwe is headed for increased revenue as a result of efforts being made to revive the sector. Minister Winston Chitando told The Sunday Mail: “The mining sector, in 2017, recorded gross revenues of around US$2,6 billion and we expect this figure to go to US$12 billion by the year 2023, and this is underpinned by growth in most minerals. For 2018, we are expecting to earn around US$3,5 billion, which is an increase in earnings by about US$1 billion from last year. 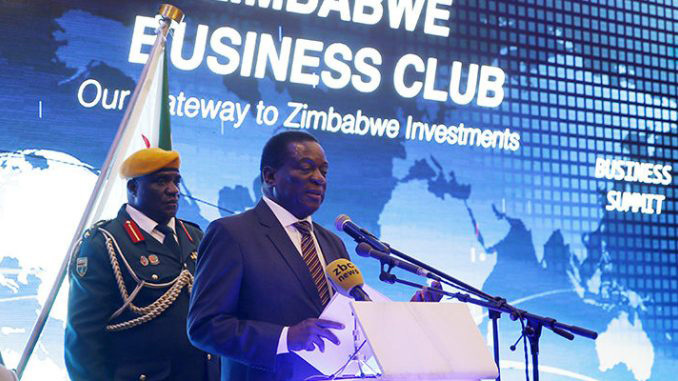 The Sunday Mail further reported that Minister Chitando said President Mnangagwa’s vision for a middle-income economy by 2030 had primed the mining sector to pursue ambitious but realistic targets, such as gold output of 100 tonnes by 2023. No doubt Zimbabwe won’t be subdued by sanctions. Instead the country will conquer and develop. Next articleSanctions: Blunt instrument of regime change…have continued sanctions achieved desired results?